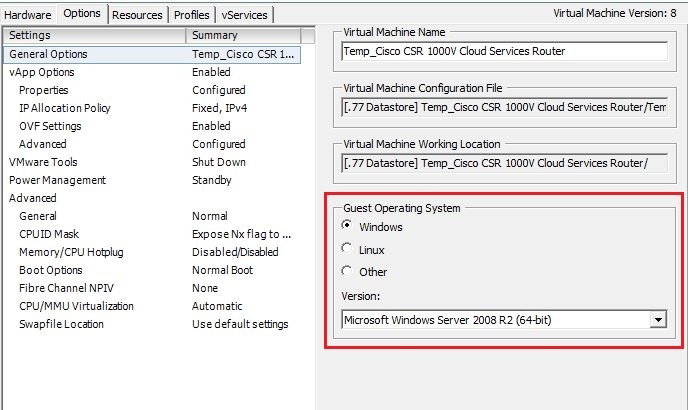 The purpose of this configuration is to decrease the time for large SQL backups in VMware virtual machines that are being backed up by VEEAM. In our scenario we have a SQL server and a File Server. We want to mount this in physical compatibility mode on the SQL server, to increase backup time by contacting the LUN on the SAN directly. 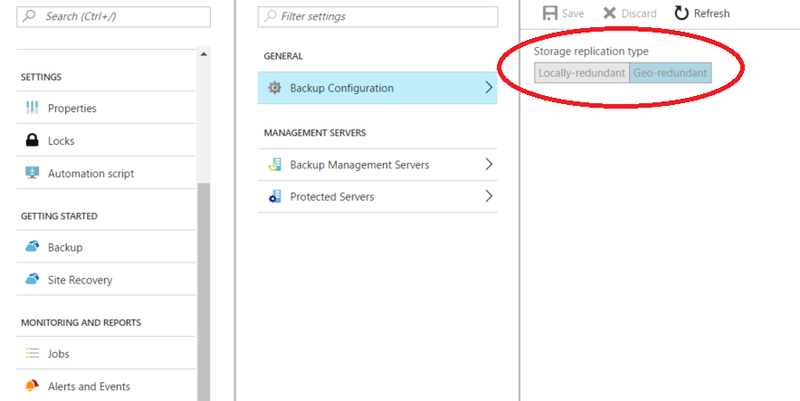 Since RDM disks are independent, we want to mount the same volume in virtual compatibility mode on the FileServer so that it can be backed up by VEEAM. For further detail on RDM, please reference the following documentation. Here are the general steps to configuring RDM for physical and virtual compatibility mode. Create a LUN on the backend storage device. Rescan for storage devices in to confirm the LUN shows up correctly, for documentation I’m using a 15GB volume. Once you’ve created that, go add a new hard disk. When you choose your disk type, choose “Raw Device Mappings”, and then select the LUN that was created earlier. Next choose a datastore that’s on the SAN that other VMs can access. Select a new virtual device node that resides on a new SCSI controller. I picked SCSI (3:0). Upon doing that a new SCSI controller will be created, then finish creating the disk. 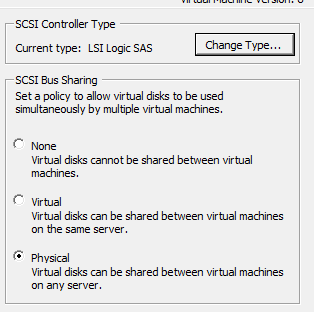 You must now change the newly created SCSI controller type to “LSI Logic SAS” and change the “SCSI Bus Sharing” to “Physical”. At this point, we’ve now created a LUN and created a RAW mapping to the SQL virtual machine. Now it needs mapped to the File Server virtual machine so it can be picked up by the VEEAM backup. Edit the settings of the File Server virtual machine, and add a new hard disk. When creating this new hard disk, select “Use an existing virtual disk” and point to the datastore where the RDM was mapped in the last step. Choose a Virtual Device node that is on a difference SCSI controller than the other disks, I choose SCSI (3:2). At this point, we’ve now created a LUN that has been mapped RAW to a SQL Server. 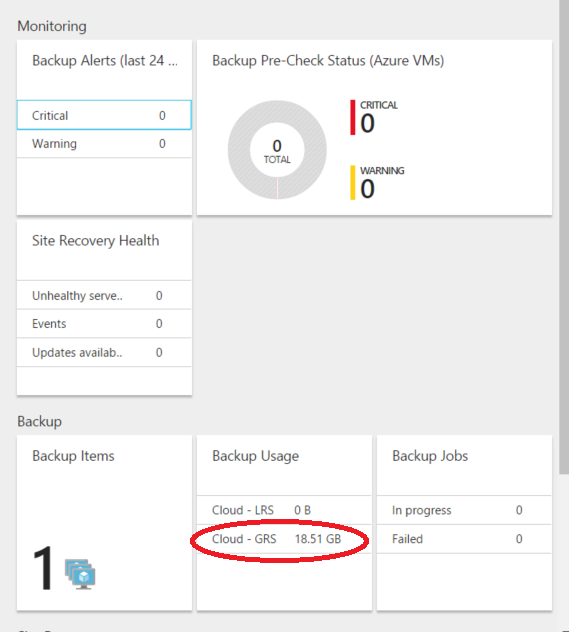 That SQL server can perform it’s backups to that disk which increases backup times by about 20% based in my testing. The File Server virtual machine and the SQL Server virtual machine both now have SCSI adapters that have bus sharing enabled, and thusly the disk is also mapped to the File Server. It is mapped here in virtual compatibility mode (inherent by adding an “existing virtual disk”). 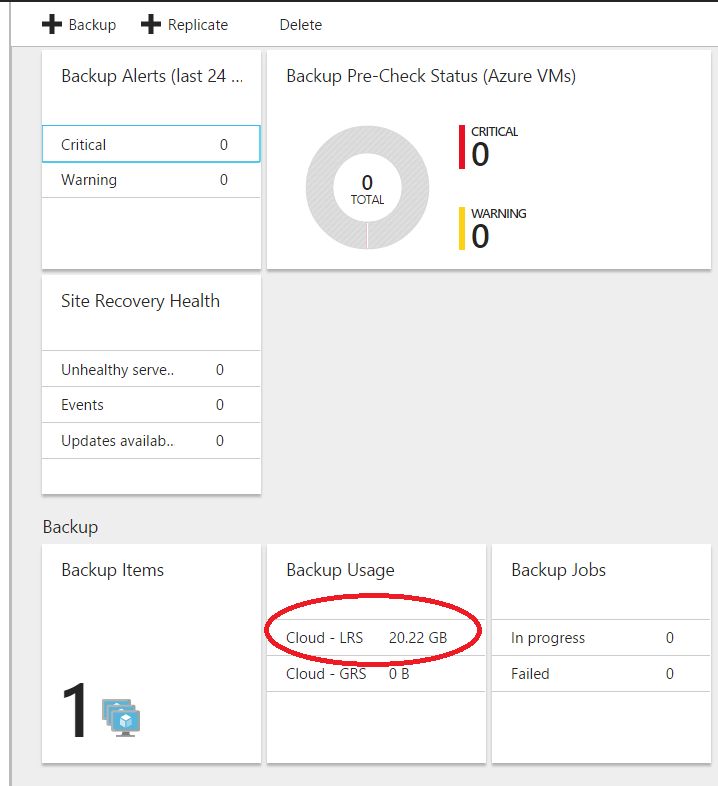 This means it’s persistent and can be backed up by VEEAM. This entry was posted in Backup, Virtualization, VMWare and tagged Physical Compatibility Mode RDM, Physical SCSI Bus Shared Disk, Raw Device Mapping, Raw Device Mappings, VMware RDM, VMware shared RDM. This past weekend I was invoking my disaster recovery plan for a system of mine and I went to boot the .iso to run the restore (CA ArcServ D2D Bootkit) and I kept on getting this error. Under the gun of pressure as the production hours quickly approached I had to figure it out. Of course this is extremely frustrating when in a DR situation. So here is the quick, and simple answer. This error occurs when you have the machine you’ve created in VMWare set to a 32-bit architecture, while attempting to boot into a 64-bit environment. Power down your VM, edit the settings like shown below to x64 and you’ll be all set! Now you’ll be able to boot up with no issues at all. I hope I’ve made your day at least a little bit easier! This entry was posted in Backup, Virtualization, VMWare and tagged Blue Screen, Blue Screen STOP error, STOP 0x0000005D, STOP error on boot, Virtualization, VMWare, WAIK, WAIK Blue Screen, WinPE, WinPE Blue Screen. I recently was given this error in a backup that was leveraging Symantec Backup Exec 2010 R2. I noticed that it wasn’t failing but was “Completing with Exceptions”. Upon investigation of the job log I found the errors above, and below. Upon research I found that in this version of Backup Exec (13.0) against this version of Windows (2008 R2) the VSS looks for the two files when they are not there — then fails and says they were not included in the backup. Fantastic. Easy fix. There are two ways you can do this. One, is that you go into “C:\Windows\INF\” and make a blank text file and name it oem13.inf and then again naming it oem14.inf. The operating system won’t ever utilize it, but it will calm the unwarranted errors in Backup Exec. The other way to remedy this is to add two simple exceptions into the backup. Launch the backup exec console, find your job in “Job Monitor” and edit the include/exclude under Source –> Selections. 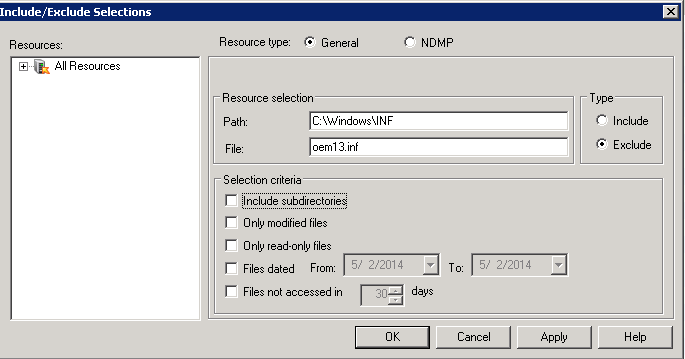 Add the path “C:\Windows\INF” and the file “OEM13.INF” then do this again for “OEM14.INF” like above. All things considered, a very easy fix. I prefer the second option so that you’re not cluttering the critical areas of the file system. Hope I’ve made your day a little easier! This entry was posted in Backup, Windows Server and tagged Backup Exec, Exceptions, not present in snapshot, oem13.inf, oem14.inf, Symantec, Symantec Backup Exec, Symantec Backup Exec 2010, VSS file snapshot warning.